← Installation Workshop #2 – done!! Jamestown, NY – When you’re enjoying St. Patrick’s Day in downtown Jamestown this Saturday [March 10], be sure to visit the Women Create exhibit at the 3rd on 3rd Gallery. Barry added that this is a special opportunity, as two of the participating artists will be present. As part of downtown Jamestown’s St. Patrick’s Day Celebration, two of the artists participating in Women Create at the 3rd on 3rd Gallery will be on hand to welcome visitors to the exhibit. Painter Toni Kelly from Erie, Pennsylvania, will be in the gallery from 9 am to 1 pm, and Fredonia artist Jill Johnston from 1-4 pm. Kelly’s acrylic and collage work, “A Winged Heart,” is shown here. From 9 am until 1 pm painter Toni Kelly from Erie, Pennsylvania, will be in the gallery. Fredonia artist Jill Johnston will welcome visitors from 1-4 pm. 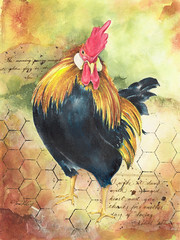 Kelly’s acrylic and collage work of a rooster, “A Winged Heart,” is on display, and Johnston is showing “Red Garden 5,” a mixed media print. These are two of the 41 area women artists whose work is being shown at 116 East Third Street, next to the Reg Lenna Civic Center in downtown Jamestown. There is no charge for the exhibit, but donations are gratefully accepted. Women Create is presented in cooperation with the Arts Council for Chautauqua County. Regular hours are 10 am-4 pm, Monday-Friday until the closing reception on Saturday, March 31. For viewing by appointment, contact Barry at (716) 664-2465, ext. 227.